Amazon Prime (a subscription service) also plays a crucial role in Amazon overall business model, as it makes customers spend more and being more loyal to the platform. Besides, the company also has its cloud infrastructure called AWS, which is a world leader and a business with high margins. Amazon also has an advertising business worth a few billion dollars. Thus, the Amazon business model mix looks like many companies in one. Amazon measures its success via a customer experience obsession, lowering prices, stable tech infrastructure, and free cash flow generation. Amazon is the largest marketplace on earth. Even though the United States represented the primary source of income for Amazon. It is expanding globally. Indeed, net sales have increased since 2014. In 2016 products represented almost 70% of total sales. Services sales have been growing at a fast pace. In terms of Operating Income, the growth has been mainly driven by the high margins deriving from the services sales. By looking more in-depth at the revenue sources, subscription and AWS services have been growing. That denotes how Amazon is expanding globally by moving more and more toward services (like Prime subscription and AWS). A business model is a crucial component of any company that wants to thrive in the long-run. In fact, many times the difference between a successful and a failing business – besides the product or service offered – is how value gets unlocked. The business model is the main driver of value. In fact, the business model can determine the difference between a monkey and a unicorn. In start-up lingo, a unicorn is a company valued more than a billion dollars. Whatever you want to call that, any start-up wildest dream is to scale up fast and get there! There is a simple reason for that. If you get to a billion dollar valuation, the chances of survival will improve exponentially. Of course, that is true in the context of North American venture capital market. Elsewhere numbers might be entirely different. One key factor in becoming a unicorn as you can imagine is about finding the right business model. According to the same analysis, 87% of unicorns’ products are software, followed by hardware (7%). For how much we love to believe that things can be easily classified. Organizations, like Amazon, have complex business models that are hybrid. Thus, rather than rely on a single type of model, they are dependent on the mixture of those models. The way those models interact is quite subtle, yet that is what really creates, unlocks and generates value in the long-term. To truly understand the business model of Amazon, we can start with Jeff Bezos vision. Then move to its revenues, but then we have to dig a bit deeper to find out a few interesting facts. At times a great place to start to understand the business models of a startup it isn’t necessarily its financials but rather how the founder sees its baby. In fact, for any founder a la Jeff Bezos its company has been nurtured just like a baby. Of course, the founders’ vision of their company can also be biased. In which case the perception of the company according to its founder and how the public perceives it might have a wide gap. However, it is a useful exercise to look at the shareholder’s letters if you want to understand the past, present, and future of any company. You can be competitor focused, you can be product focused, you can be technology focused, you can be business model focused, and there are more. But in my view, obsessive customer focus is by far the most protective of Day 1 vitality. As companies get larger and more complex, there’s a tendency to manage to proxies. …The process is not the thing. It’s always worth asking, do we own the process or does the process own us? …We’re in the middle of an obvious one right now: machine learning and artificial intelligence. Jeff Bezos offers a portrait of Amazon which is useful to understand its business model deeply. First, it all starts with Day One. Which, for me is a way for Amazon to keep a “start-up mindset” also if it has become a large organization. It means focusing on customers, therefore, experimenting with new products lines, services or anything that might become “delightful” to the public. In fact, once Amazon does identify strong trends, rather than fight them it embraces them. One example is how nowadays Amazon is using AI and machine learning as the main propellers for its business growth. In other words, practically speaking this makes Amazon fluid. Thus, the Amazon of tomorrow might have a different face – but the same soal – compared to the Amazon of today. Amazon is a giant marketplace where each day billions of people find anything from the latest best selling book to things like Nicolas Cage pillowcase. According to the Similar Web estimates each day, only in the US Amazon has over 2.7 billion visits. On average those people spend more than six minutes on the site and look at almost nine pages purchasing what they’re looking for. We serve consumers through our retail websites and focus on selection, price, and convenience. We design our websites to enable hundreds of millions of unique products to be sold by us and by third parties across dozens of product categories. Customers access our websites directly and through our mobile websites and apps. We also manufacture and sell electronic devices, including Kindle e-readers, Fire tablets, Fire TVs, and Echo, and we develop and produce media content. We strive to offer our customers the lowest prices possible through low everyday product pricing and shipping offers, and to improve our operating efficiencies so that we can continue to lower prices for our customers. We also provide easy-to-use functionality, fast and reliable fulfillment, and timely customer service. In addition, we offer Amazon Prime, an annual membership program that includes unlimited free shipping on tens of millions of items, access to unlimited instant streaming of thousands of movies and TV episodes, and other benefits. We offer programs that enable sellers to grow their businesses, sell their products on our websites and their own branded websites, and fulfill orders through us. We are not the seller of record in these transactions. We earn fixed fees, a percentage of sales, per-unit activity fees, interest, or some combination thereof, for our seller programs. We serve authors and independent publishers with Kindle Direct Publishing, an online service that lets independent authors and publishers choose a 70% royalty option and make their books available in the Kindle Store, along with Amazon’s own publishing arm, Amazon Publishing. We also offer programs that allow authors, musicians, filmmakers, app developers, and others to publish and sell content. An effective business model to work properly has to involve and generate value for several stakeholders. That applies to the Amazon business model as well. In fact, when I get into the Amazon marketplace as a consumer, I can find anything across dozens of products categories. Among those, I can also buy Amazon products (like Kindle, and Echo), or subscribe to Prime (to get faster delivery and even access to an on-demand library of contents). Also, thanks to Amazon seller program the company earns fixed fees, a percentage of sales, per-unit activity fees, interest, or some combination of those based on the transactions generated by the marketplace; Although AWS is a platform of its own. Nonetheless, it has a strategic role in Amazon. Last but not least, the KDP platform allows thousands of independent authors to publish their e-books and info-products. According to the plan in which the independent author enrolls into Amazon will earn anywhere from 30-70% of royalty fees from the sales. Like all the other tech giants Amazon could create such a robust business model that it now works as the main engine for the dominance of the company in the next decade. As technology becomes more and more competitive business models lose effectiveness. However, a business model well-designed can make a company capture value for a long time! It’s time to dive into the numbers to understand how the company works. When trying to understand a business model, the revenues are a good starting point. But it’s also important to look at other financial metrics to deeply understand what’s the real cash cow. In fact, it’s easy to be fooled to believe a company falls into a specific business model. However, numbers don’t lie. Where does Amazon stand? According to the infographic, you can see that Amazon makes most of its revenues from the sales of products. However, those products sales also have high costs. Thus, the margins Amazon makes on them is thin. Instead, if we look at the operating income, you can see how this is fueled by the services, which comprise seller services, AWS, and subscriptions services. In other words, by looking at the revenue, you might be fooled to think that Amazon is in the product business, just like Apple, yet there is a slight difference between the two companies! Like many things in business, so revenue generation seems to follow a power law. You try quite many things, but you end up with one reliable and sustainable source of income after all. Sometimes the differences in business models are subtle. Take Apple and Amazon. As they generate most of their revenues from “products” one might think they have the same business model. However, with a more in-depth look your realize their model is entirely different. In fact, while Apple sells its iPhone at a high margin, Amazon sells its products at a thin margin (in fact, cost of sales for Amazon is almost as high as the revenue generated by its products). In short, Amazon seems to use its products to ramp up its services revenues, which seems to be the real cash cow. However, if you look at revenues alone, you might be fooled to believe Amazon is in the “product” business. Let’s give a look at Amazon business model from several perspectives. The aim is to have an overview of Amazon that goes beyond the conventional wisdom that Amazon is a product company, it’s much more than that! Beyond the look, we have given so far at the Amazon Business Model, I want to give you an in-depth look so that you can really appreciate how the Amazon business model works and what powers up its business engine. If we look at the Amazon revenue model, a few things pop up right away. As we saw the online stores are still the core part of the business. However, the core business is the foundation for other emerging businesses that run with different logic to its online stores. Where online stores run at tight margins and high volume by taking advantage of cash conversion cycles. Other parts of the Amazon business model, like Amazon Advertising Services, Amazon Prime and Amazon AWS run with much higher margins. Thus, Amazon online stores are the foundation for those other businesses that make the overall company more profitable in the long run. Let’s give a look at the Amazon cash machine, which is the foundation of its ability to expand, and disrupt other industries, while expanding in other areas. One of the key elements of the Amazon business model is its cash machine business strategy. In short, Amazon has operated (and still does) for years at very tight profit margins on its online store. The company has willingly done so throughout the years, as it made its prices low, convenient compared to traditional physical stores, and with a fast and efficient delivery system, what Amazon calls fulfillment centers. This might give the impression that Amazon doesn’t generate enough cash flow to its business. However, that’s quite the opposite. As Amazon collects payments quickly from its customers, it then pays its vendors with relatively longer payment terms. This gives Amazon short therm liquidity that can invest back to speed up growth. With this mechanism, Amazon has been able to disrupt several industries. Starting as a bookstore online, it quickly expanded in all the other industries. One Amazon has built the most valuable two-sided marketplace on earth it has become way easier for the company to offer many other services. Amazon more than doubled its advertising revenues from the first nine months of 2017, compared to 2018. Indeed, the revenues went from $2.92 billion in 2018 to $6.72 billion in 2018. Compared to Facebook $38.37 billion and Google $83.68 billion for the same period, Amazon is still a small player. However, if we take into account that Amazon runs a diversified business model, with several revenue streams, it also gives the company more space to experiment with advertising! A few people realize the among other businesses, Amazon has become a digital advertising provider. And not a small one, but among the very few able to compete against the duopoly Google-Facebook. Indeed, as of the first months of 2018, Amazon advertising business netted over six billion in revenues! With such an infrastructure and many e-commerce hosted on Amazon infrastructure, more and more entrepreneurs and marketers are willing to pay for Amazon advertising services. This part of the business has higher margins compared to the tight margins of the online stores. Many companies nowadays have shifted to the subscription business model. Amazon has converted part of its business to accommodate this change. Amazon Prime is a critical element of Amazon growth strategy. The logic is simple, the more people join the Prime Memberships, the more products they purchase on the online stores. Indeed, with Prime, members enjoy from faster delivery services besides the access to Amazon original content offered via streaming. This subscription model also creates a more stable and predictable income over time. Started as an experiment back in 2000, the Amazon AWS has grown to become an over seventeen billion dollars business in 2017. AWS also enjoys higher margins and network effects. Amazon is doubling down on that as this business unit will be critical to its future succes. Back in 2001, Jeff Bezos sketched on a piece of paper a flywheel that would become Amazon key marketing strategy for years to come. The Amazon Flywheel or Amazon Virtuous Cycle is a strategy that starts from customer experience to drive traffic to the platform, which traffic gets monetized via Amazon selection of products and by inviting third-party sellers to join the platform. That improves the selections of goods, which Amazon would have taken years to build. In turn, the customer experience improves further. At the same time, Amazon uses the cash generated to further improve its cost structure. Rather than distribute the additional cash to shareholders the company passes it on to customers via lower prices. This process contributes even further to the virtuous cycle which makes Amazon expand and take over other industries. This marketing strategy has been used since the first years by Amazon to expand its operations. Amazon is a tech giant. When it started back in the 1990s, it began as an online bookstore. Today Amazon is the store that sells anything imaginable. As its founder, Jeff Bezos has specified Amazon is a customer-centric company. However, it is clear that what made and makes Amazon so compelling is the business model it and which generates value for several players. Consumers find products at a lower price and get them fast. Sellers can find new market opportunities or decide not to carry any inventory. In fact, Amazon has its own fulfillment center that manages the inventories for sellers. Thus, that makes it easier for anyone willing to start an online store to have lower barriers to entry. Developers and enterprises can rely on AWS cloud services. Content creators can effectively monetize their info-products through programs like KDP. And customers can consume Amazon original content via Amazon Prime. Even though Amazon makes almost 70% of its revenues through products sales. In reality that part of the business is the foundation to grow other more profitable segments. 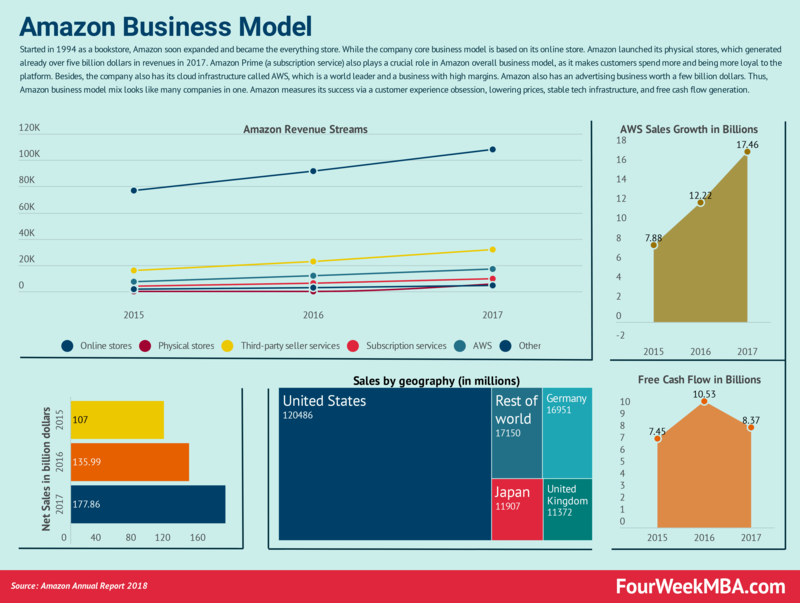 From Prime, Advertising, and AWS, thanks to its cash machine Amazon has been able to create a diversified business model. Thus, who’s thinking of Amazon as just an online store has been fooled by its revenues, but has not bothered to look at how its business model really works! Amazon shows us a valuable lesson. For how much we like to categorize things under fixed, immutable categories and definitions. Often, a company to become a multi-billion enterprise has to create a hybrid business model that takes advantage of several revenues and business models at once. Take Google, it started as a search engine with an advertising business model, yet it is now diversifying in other areas. In fact, even though 86% of Google revenues still come from advertising in 2017, Google makes money in many other ways. Nicely written post Gennaro…Couldn’t stop myself to share this… Keep writing stuff like this.. cheers!! Thank you Ashish! Did you like the one-minute video explainer? Previous Previous post: How Much Is Facebook Really Worth To Users? How Much Is Facebook Really Worth To Users?